The simple device (at right) allows you to bypass the drain feature of your air gap faucet if you want to. 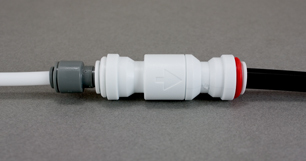 It's a check valve—it allows drain water to flow away from your unit but not toward it. The white tube is the drain coming from your RO unit. The black tube connects to the drain saddle on your drain pipe. Fittings are John Guest-style Quick Connect. The only installation tool you'll need is a pair of scissors. Remove the drain tubes from the faucet, trim as needed, and plug the ends into the adapter.